The fourth annual Chords for Clark concert will benefit the choirs of GRC High School. 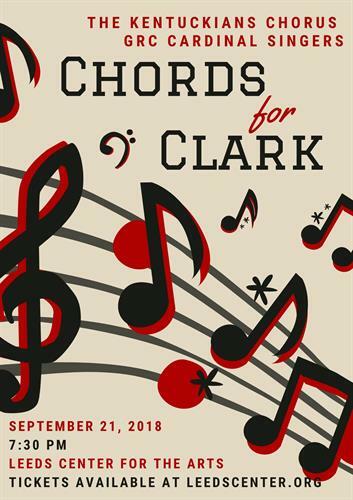 Featuring the GRC Cardinal Singers and the renowned men's chorus from Lexington, The Kentuckians Chorus, the night will include choirs, barbershop quartets, comedy, and more fun, all toward supporting the musical endeavours of Clark County's youth. The concert will take place at the Leeds Center for the Arts on Friday, Sept. 21 at 7:30 p.m.
Tickets can be reserved at www.leedscenter.org.